At the time a few local developers—Doug Rohrer, Chris Nelson, Paul Henrich, Jason Voegele and I—had been meeting on a regular basis to hack on Elixir. We had been working on a Kafka adapter for Elixir but, after a client project moved away from Kafka, we decided to set the project aside. So I pitched the idea of working on a DDP client for Elixir. I already had a pretty simple working example of sending a connect message to the basic leaderboard example app in Meteor and getting a response back. Around this time, humanity had managed to land a rover named Philae on a comet! So naming our little experiment Philae made sense. 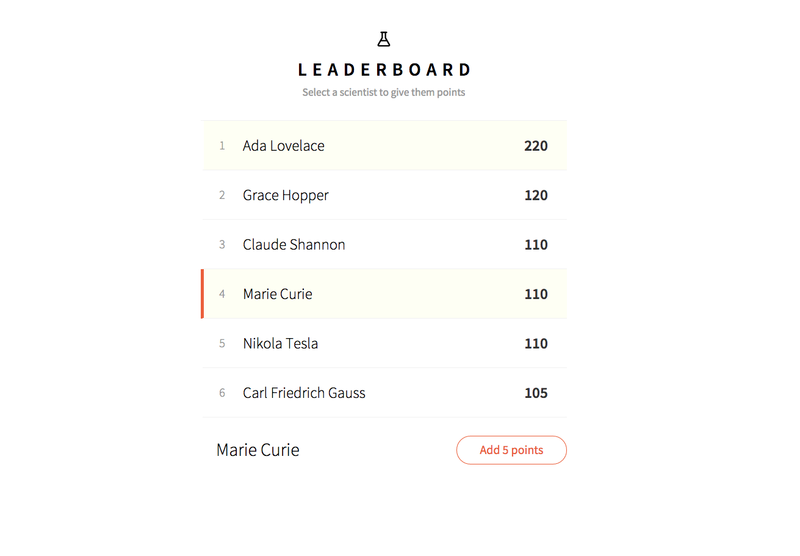 The leaderboard app in Meteor has served as our example app for working on Philae, so we will be connecting to it here. I’m going to walk you through the basic process we used to connect to a Meteor app using our in-progress library Philae and build a small example Elixir app along the way. Next you will need to add Philae to your mix dependencies. For now you will need to add Philae’s as a Git dependency. We plan to eventually release the library as a hex package. Visit http://localhost:3000 and you should see a basic leaderboard. This gives us everything we need to connect to our Meteor app and get some messages back over DDP. Next let’s start the Elixir REPL with our application loaded and make a connection to the Leaderboard app. This tells us we are now connected to the Meteor app, and we get an id for our session that we will want to keep track of. Why do we get the same message twice? Well this is the message that our Leader GenServer received from the Philae.DDP GenServer. It’s messages, processes and GenServers all the way down! Next we see some more useful messages in our log telling us that some players were added to a collection called ‘players’. Once again we can see we logged a message coming into the WebSocket, as well as the message we received in our Leader GenServer process. Why are we receiving these when we haven’t subscribed to the player collection yet? By default Meteor includes a package called autopublish. This is something you want to remove before publishing an app, so let’s go ahead and remove it. Let’s go ahead and get connected to the player collection again. Ok what is happening in this function? First we are going to connect to our Meteor app. This time, however, we are going to capture the client pid we get back, which is the process id to the socket. Next we call the subscribe function passing in the client_id we captured as the first parameter and the name of the collection we want to subscribe to, in this case “players”. We match the collection and id that we get back from the call to the subscribe function and return them along with the client_pid as the state for our GenServer. Now if we restart our iex session (by typing ctrl-c twice) and start our Leader GenServer, we get something scary. A 404 error message that looks like this. Yikes. This is because Meteor can’t find our subscription. When we removed autopublish, we didn’t tell Meteor what to publish. Let’s go ahead and tell it to publish the “players” collection. // it is backed by a MongoDB collection named "players". // On server startup, create some players if the database is empty. Restart your iex session and Leader GenServer again and we should now get back messages from the player collection once more. Now with both your iex session and your meteor app running, visit the Meteor app in your browser http://localhost:3000. This time let’s vote for Ada and see what happens. Now we can see that we are receiving messages whenever items in the collection are modified. Awesome! This is cool but what can we do with it? So far we have mostly just been been receiving messages from Meteor. Let’s go ahead and respond to these messages and use Meteor’s RPC capabilities. Let’s say that Ada Lovelace is our personal favorite computer scientist, and we want to make sure she is always in the lead. So let’s create a simple auto voter. Anytime we see someone other than Ada voted for we are going to give Ada a vote to keep her in the lead. Logger.info "Yeah! Ada is my favorite"
OK, now when we restart our iex session we see an extra log message telling us Ada was added and that she is in fact our favorite. What else is going on here, though? If look at the first handle_call, we used pattern matching to match on Ada’s name and capture her ID. Next we are creating a new GenServer state from the previous state and adding Ada’s ID; then returning it as the next state for the GenServer process. This means that when we receive changed messages later we will be able to tell if the changes were to Ada’s record or not. Now let’s do just that. Let’s implement handle_calls for :changed messages and use pattern matching and a guard clause to tell when it is Ada’s record that has changed. Logger.info "YAH another vote for ADA!" Here we can see on line 35 we are matching on Ada’s ID and the ID of the current record being passed from the Meteor collection. When they match our guard matches and our function is dispatched and we see a celebratory message in our iex session. If they do not match, we move on and the next function matches and simply logs the message out as normal. 22:42:15.908 [info]  YAH another vote for ADA! Here we added a function to our isServer section of our Meteor app in Meteor.methods. Then find a player by their PlayerName and update their score by an increment of 5. Now let’s implement a Voter GenServer process to vote for Ada. Let’s start and link our new Voter process/GenServer to our leader in lib/leader.ex in our init function and add its pid to the Leader GenServer state. Whenever we vote for someone now, we should see that Ada gets a vote almost immediately after. Pretty neat. This is a limited example of using Philae and what you can do with Meteor and Elixir. Philae has a long way to go before it is ready for primetime. We are still working on it as a group at the Cincinnati Elixir Meetup and plan to release it as a hex Package as soon as it gets a little further along. Like what you see? Subscribe to Gaslight’s monthly email newsletter for coding tips, tech insights, events, news and more delivered right to your inbox from the Gaslight Team!